I am a firm believer in creating an outdoor space that reminds people they are part of a larger, natural ecosystem. We spend our lives inside, separated from the fresh air, sunshine, and creatures great and small. Your yard, garden, or lanai should be a place that connects you to nature, giving you a place to enjoy the outdoors as much as you enjoy the indoors. 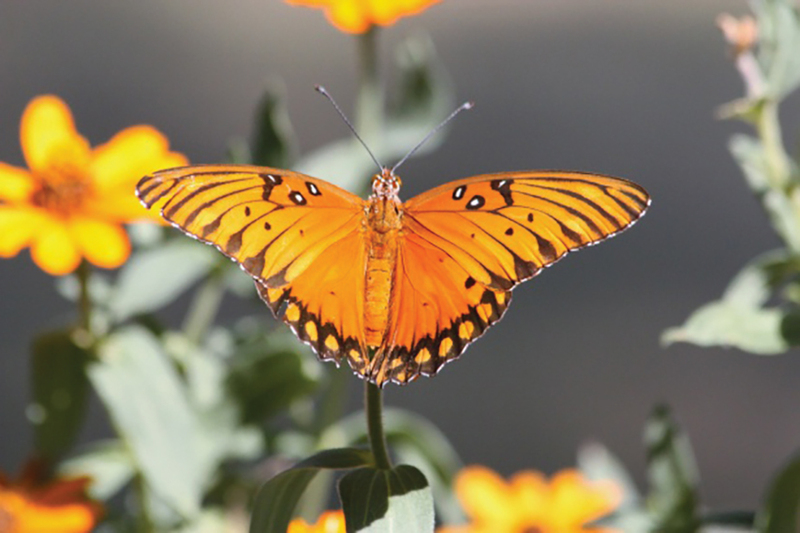 A wonderful way to create a relaxing, nature-focused yard is through butterfly gardens. Filled with color, layers, and texture, these gardens elevate your home’s exterior and give these beneficial insects a home and food source. Here are some of the ways I love to create these special gardens here in Southwest Florida. The plants you choose are the most important element of the garden. They give the butterflies a place to land, a food supply, and a safe home for their eggs. The foliage also gives your yard texture and visual interest. Butterflies are attracted to color, especially red, hot pink, and orange since these flowers tend to have the most nectar. 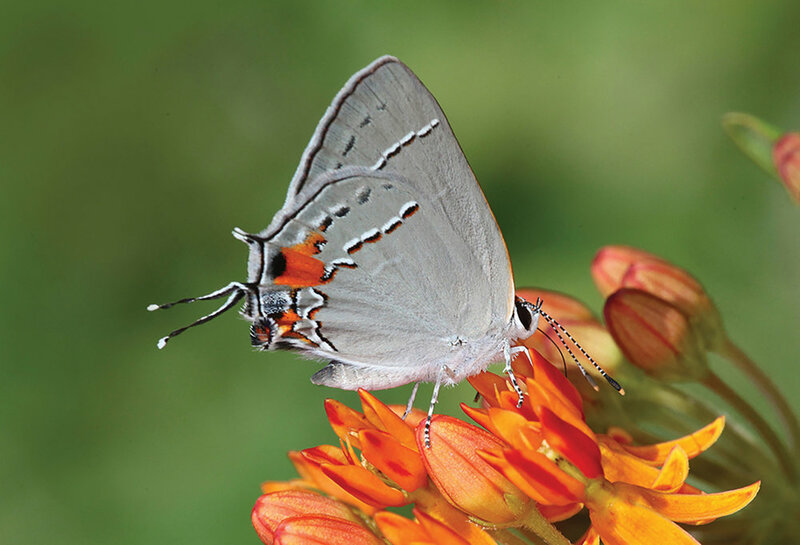 Plants like Penta, Jatropha, Firebush, Lantana, Dune Sunflower, Red Firespike, Coral Honeysuckle, and Morning Glories are great options which provide nectar for grown butterflies and encourages them to lay eggs. These plants also provide the palette that makes your yard a true retreat. Beyond blooming options, I love to layer different shades of green and interesting textures into a butterfly garden. Blooming plants are seasonal so there will be times when the colorful flowers aren’t prominent. 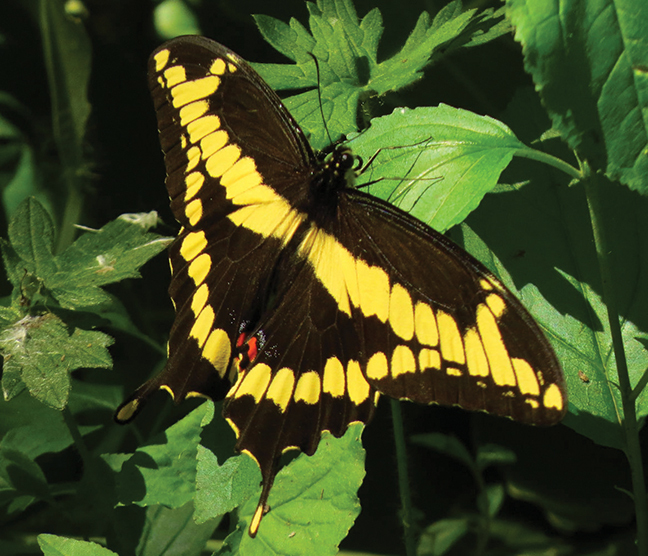 When that happens, using differing greens or plants with colorful leaves is a way to keep your butterfly garden (and yard) visually interesting all year long. Blooming plants also shed their flowers so mixing in less high-maintenance (but still beautiful), options like Copperleaf can help you keep yard work to a minimum. (Left) Butterflies are attracted to colors so make sure there are plenty bright flowers in your garden. (Center) Paths that meander add a little extra magic to your garden. (Right) Non-blooming plants help minimize the amount of maintenance since they don’t have flowers that fall off. Please don’t spray your yard with pesticides! As you take the time to work with someone to plan the garden, make sure you also have a plan to naturally control pest problems that may pop up. Butterflies are just beautiful bugs and like all bugs, spraying your plants won’t encourage them to use your lovely garden as their home. If you are worried about caterpillars eating your plants, I suggest giving them their favorite food options throughout your garden so they aren’t tempted to eat other foliage. Caterpillars love milkweed so planting a little “buffet” area will help ensure they will stay away from your roses and impatiens. Pests usually occur when there is an overabundance of one plant, a monoculture, in your yard. Combining a variety of plants keeps the ecosystem healthy. I love to center all my gardens around a path. Whether walking the dog or taking out your trash, you should have a clear path through your yard or garden that’s pleasing to the eye and surrounded by nature. Adding curves or wrapping the path around a corner creates a sense of wonder as you never know what kind of beautiful bird, colorful butterfly, or fuzzy garden creature you will see as you make the turn. Grass, stone, gravel, or pavers are all great materials I use when creating this important foundation. Once I know where the path will lead, I look at the structure of the garden. Scale, texture, and color are all important aspects when creating any landscape design. You can also create a butterfly garden with pots and containers. This is a great option for people with patios or small yards or those who rent. Butterflies have been seen at heights of 1,000+ feet so even condo owners can get in on the winged action. Again, colorful nectar producing plants for the adults and plenty of caterpillar food are the keys for creating a robust container garden that will attract these magical creatures. Beth has a true passion for creating gracious garden scenes and outdoor spaces that are inviting, lush, pretty, intimate, and tropical. She has developed and implemented a wide array of custom tropical garden designs throughout Naples and Collier County since founding Greenery Wizard in 2012.